Dress your modern family in DIY Stone Age costumes and transform into an iconic television family! Check out this collection of awesome homemade Flintstones costumes. Then take off your shoes and transport yourself to the town of Bedrock. These are classic costumes for any family. Versatile and fun – they can accommodate all family sizes very well. If you need extra characters, check out the adorable Dino costumes here. Also, take a look at the hilarious costumes here. For instance, the Bam-Bam costume with airbrushed muscles. 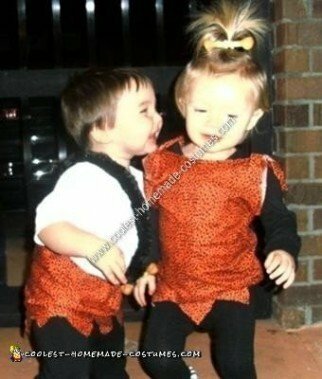 Or the twin babies dressed in Fred and Barney costumes. In addition, check out all the couple costumes here. Besides from the classic Fred and Wilma, check out Pebbles and Bam-Bam as well as Betty and Barney Rubble. As a bonus, these are fantastic costume ideas for affordable, instantly recognizable costumes. 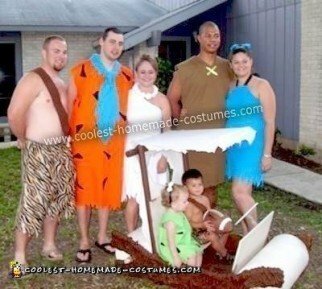 So have a yabba dabba doo time this Halloween with these awesome homemade Flintstones costumes!